Entertain lavishly in one of Moscow's largest suites, a full 227 sq. 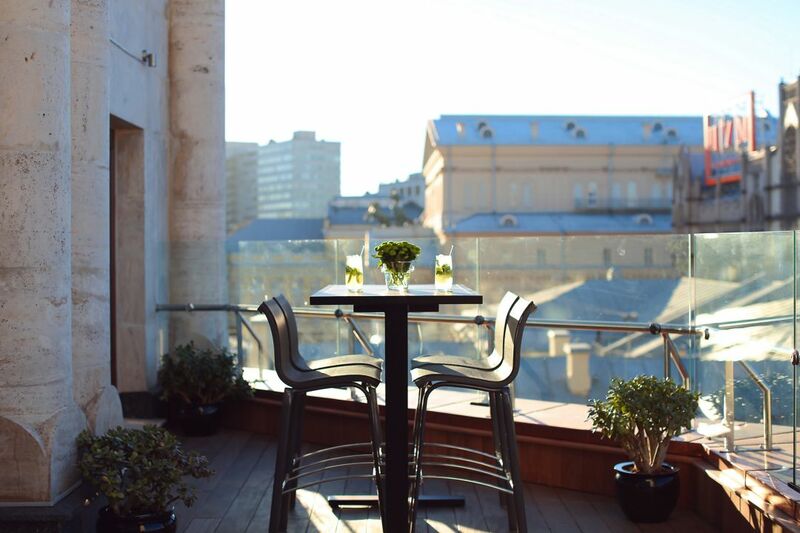 metres, offering panoramic views of The Kremlin, Bolshoi and State Duma, furnished with crystal chandeliers, detailed carvings and contemporary works of art. Includes living area, formal dining for eight, kitchen, two marble baths with sauna, and bedroom with four-poster king bed. Welcome to a newly renovated 180-sq.-metre two-level Penthouse suite featuring the sleek yet cozy, understated and intimate interior by Tony Chi. Marble circular jacuzzi tub with a full mirror television entertainment. The magnificent and elegant suite up to 125-sq. meters featuring simple contemporary design. Pampering amenities include 2 spacious living rooms, separate work area, Italian marble bath with tub and walk-in shower, exclusive Blaise Mautin toiletries, bedroom offering a plush king-size bed and spacious private terrace with dining area and panoramic views of the city centre. Understated and intimate, this 70-90 sq.-metre two room suite with a private terrace and sumptuous design. Each suite features a king bed with luxurious linens qnd custom-design lighting. A generous bathroom offers heated floors, two sinks, a rain shower and signature amenities from Blaise Mautin. Enjoy panoramic views of The Kremlin, Bolshoi Theater and State Duma from the elegant 110-sq.-metre suite featuring simple, contemporary decor. Pampering amenities include spacious sitting room, generous work area, Italian marble bath with separate tub and walk-in shower, exclusive Blaise Mautin toiletries, and bedroom offering a plush king-size bed. Designed for sophisticated travelers, combing contemporary luxury with simple elegance, this 97-sq.-metre suite offers a king-size bed with plush linens and feather duvet, elegant lounge with guest bath, and generous work area. Enjoy panoramic views of The Kremlin, Bolshoi Theatre and State Duma from an elegant 138-sq.-metre suite featuring baroque interiors with high ceilings and original art by contemporary masters. Includes spacious living and dining areas, premium open bar, Italian marble bath with tub and walk-in shower, and bedroom with plush king-size bed. Understated and intimate, this 65-73 sq.-metre two room suite with a sumptuous design. Each newly-renovated suite features a king bed with luxurious linens and custom-design lighting. Understated and intimate, this 65-73 sq.-metre two room suite with a sumptuous design. Each newly-renovated suite features a twin bed with luxurious linens and custom-design lighting. Stunning views of The Bolshoi Theatre, Neglinnaya Street or the courtyard welcome you to a newly-renovated 35-40 sq.-metre room with a king bed featuring contemporary design and a state-of-the-art room management system. Stunning views of The Bolshoi Theatre, Neglinnaya Street or the courtyard welcome you to a newly-renovated 35-40 sq.-metre room with two twin beds featuring contemporary design and a state-of-the-art room management system. Enjoy a stylish and unique interior, as well as stunning views of The Bolshoi Theatre, Neglinnaya Street or the courtyard, with this newly-renovated 45-50 sq.-metre deluxe room with king bed featuring contemporary design and a state-of-the-art room management system. Enjoy a stylish and unique interior, as well as stunning views of The Bolshoi Theatre, Neglinnaya Street or the courtyard, with this newly-renovated 45-50 sq.-metre deluxe room with two twin beds featuring contemporary design and a state-of-the-art room management system. Enjoy a stylish and unique interior as well as breathtaking panoramic window views of historical center of Moscow, with this newly-renovated 35-40 sq.-metre room with a king size bed featuring contemporary design and a state-of-the-art room management system.